It’s My 4 Year Blogiversary Today! Of Course I’m Having A Giveaway! This is my 251st post! Here is a link to my very first post. How funny that I just restarted my Farmer’s Wife Quilt last month from scratch. Sewing it really scrappy was not working out for me and I wanted it matchy-matchy. Plus, I didn’t have my printer settings set to 100% actual size when I printed ALL the templates. It’s all a learning experience though and my freshly reprinted templates are the correct size this time around. 🙂 Click here to see my three new Farmer’s Wife blocks from my Instagram feed. So, here are my finishes that I have to show you plus one WIP that I’m making serious progress on. 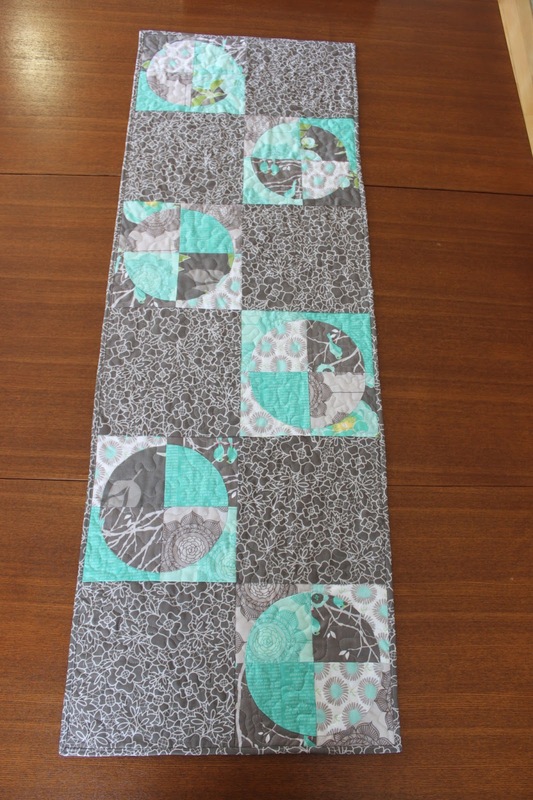 First up is my “Modern Quilt Guild Riley Blake Fabric Challenge” project. I received a bundle of free fat eighths from the MQG to work with. This is the “Cottage Garden” line by Amanda Herring of “The Quilted Fish”. The challenge was to use only fabrics from this line, and coordinating Riley Blake solids, and to sew something we’ve never sewn before. I have never sewn Drunkard’s Path blocks before so this was my first ever time sewing them (I started these before my “Horizon Lines” mini). I have Angela Pingel’s book “A Quilter’s Mixology” which is a great book for learning curved piecing. I love it! She has an awesome tutorial on her YouTube Chanel and that is the method I used to create these blocks. One pin people! Such a time saver! I made a table runner with my Drunkard’s Path blocks. I made a hoop using Tula Pink fabrics. I was so happy I had a brain wave and remembered this camping fabric with the tents from her Moonshine line. It was perfect if I do say so myself! The little felt camper is a pin cushion but both Lisa and I say it’s too cute for pins. Who remembers “The Polka Dot Door” from being a kid. Yes, I’m dating myself here. A closer look at the hoop. I didn’t have any cute pom-pom trim but I glued the same ribbon as the hanging ribbon all around the edge of the hoop. The vintage trailer pin cushion complete with Liberty of London curtains, vintage 50’s ric rac trim and a resident gnome. I seriously almost died from the cuteness when I finished this. (This took me 4 1/2 hours to make in case you wondered.) I used two black buttons for tires and two white buttons for hub caps. I used two little red buttons that kind of had a “reflector” look for the tail lights. And here is my WIP from last week. It’s all quilted now (by me on my Juki) and the binding is sewn onto the front. I will be sitting in my comfy IKEA Poang chair and sewing the binding down this evening. This is the “Penny Candy” quilt from Kathy Brown’s book “Strip-Smart Quilts.” (Martingale Publishing) The fabric is “Holiday Happy” by Monica Solorio-Snow (The Happy Zombie) for Lecien. Okay! So, thanks for coming to my Blogiversary Party!!! Here are my two giveaway prizes that I have for you from my stash. The first is 5 fat quarters of Aneela Hoey’s “Sew Stitchy” fabric. Please use the Rafflecopter to enter so it’s easier for me to pick the winner and there’s no issue with “no reply” bloggers. If you do not use Facebook you can log in with your email. I will leave the giveaway open until midnight August 12th and will mail out the prizes to two winners on the 14th. 🙂 Anyone can enter worldwide. Winners will be contacted by email and announced here. Thank you for celebrating with me today! I would love the cotton and steel!!! Congrats!!! I would be happy with either 🙂 Both are great picks! Congrats and thanks for the giveaway! I am down with the cotton+steel Mustang!! Congrats! I blogged for a while but couldn't keep it up. Congrats to you for having a blogiversary ! I like them both but I have no Cotton and Steel so I would go with those! Love the Cotton and Steel and I have none! I would like to win the Cotton + Steel basics and mustangs. The set with the cute mustangs! Congratulations, Anita! Those are quite the milestones. Also fun that you share a birthday with your mom. My twin brother and I shared a birthday with our grandpa and I always liked that there were two people who, when they wished me a happy birthday, I could wish them one back. Happy Blogversary Anita! Great finishes posted. I love C+ S! Congrats!! I am drawn to the colors of the C & S. Will be happy with either. Congratulations on your 4th year of Blogging – your anniversary party is great – love the camping things. I like the Sew Stitchy bundle – love the birds! Thanks for a chance to win. Happy Blogiversary! They are both gorgeous! I think I like the Sew Stitchy, but they are both great. The cotton and steel is the one I would love to win…..
Hi ! Congrats! Neat giveaway! I would select Aneela's fabrics ! Thanks for sharing a sweet giveaway! I love them both, but I would love the C&S as my daughter rides horses and I would love to make her something from this bundle. Happy 4th year!! Im a cotton and steel kind of girl! I really like cotton and steel but this time the colours of the 5 fat quarters of Aneela Hoey's "Sew Stitchy" fabric is the winner for me! First I have to say that the camper trailer bunting is just so gosh, darn sweet!!! It is perfectly my style!!! Now if I were lucky enough to win, I'd choose prize #1… Love those pretty fabrics! I'd love to have the Sew Stitchy FQs! Congrats on your 4 yr blogiversary! and 15th Anniversary. Both are quite an accomplishment. And I swooned over the trailer buntings. So so cute! Happy Bloggaversary to you and I wish you many more! I'm sure your mom loved the table runner…how sweet that you two share the same birthday. If chosen, I'd prefer the Aneela Hoey's "Sew Stitchy" fabric bundle. I think they'd mingle best with my stash! Happy Blogiversary!!!! Love the Table runner! But the lil' Campers are sooooo cool!! My Daughter would love them!! I'd be happy with either, but slightly prefer the first. I like the first FQ bundle. I love the table runner and the Vintage Trailer pin cushion is adorable. Thanks for the chance to win either of those wonderful FQ bundles. Happy Anniversary! I love the resident gnome. I would love the Sew Stitchy fat quarters. Happy Anniversary! I love the C+S but would be happy with either! Thanks! Thanks for the chance to win fabric. I like both, but If I had to choose, then It would be the Sew Stitchy bundle. Both are great…but Cotton & Steel is my fave! I'd be happy with either one, I see a project for both. Love your bunting, very cute. I would choose the "sew stitchy" bundle. Happy blogoversary! I love the vintage caravan makes, they are so cute. Either bundle is great. Thanks and happy blogoversary! Nice work on the curved piecing! & the campers are adorable! Happy Blogiversary! Great giveaways- thanks for the chance. Sew Stitchy is my favorite. Happy Blogiversary! Thank you for the giveaway. Congrats on 4 years of blogging! Huge milestone! Either fabric bindle would be great, but I think I would go with Sew Stitchy! Happy Blogiversary!!! I like them both and would completely happy with either. If I must choose it would be Sew Stitchy! Happy Blogiversary! I love the Sew Stitchy fabrics. Thank you for the chance to win. The Cotton and Steel, please! The dottie fabric is one of my current favorite basics, I use it in almost everything. 🙂 Happy blogiversary and anniversary!! Would love to win the Cotton + Steel basics and mustang, thanks! Love the Sew Stitchy but both are great!! Happy Blogoversary!! Anita: Happy Anniversary (both blog and wedding). Great projects. I love the travel trailers and all the little details. The pin cushion is so cute, I can't believe you gave it away…but then we always make for others rather than ourselves. If i were to be lucky enough to be chosen, I'd like the turquoise fat quarters. But either are nice looking. Thank you. The Cotton and Steele Is my fav! Lovely prizes. If I had my choice I would say the Cotton and Steel bundle is my favourite. Plus I am working on a mustard and navy quilt right now and those fabrics would be great in it! Congratulations! Both are very generous, but since I have never seen the Sew Stitchy fabric before, I would prefer that one. Thanks! Congratulations! And I don't think I commented at the time, but congratulations on going independent. I agree that it's frustrating to read through a bunch of boring stuff to have to get to the content you're looking for. There was one post I read as part of a bloghop that was 95% gloating about one particular sponsor and 3% talking about why the writer was wonderful enough to have sponsors, and 2% review of product. I wasn't sure whether to be angry that so much of my time had been wasted, or find it hilarious. That said, I'm leaning towards Sew Stitchy. I've got a ton of Cotton + Steel. Happy Blogiversary and VERY Happy Anniversary, Anita!!! If I was lucky enough to win, I would choose the Sew Stitchy and add it to my red and aqua stash for someday. Happy anniversaries. I would go with Sew Stitchy. Marriage is a WIP for sure. Still working at it after 40yrs. Congrats! Happy Anniversaries! I'm in love with that little vintage trailer pincushion…. I could just squeal with delight at the sight of it! If I happened to win first I'd like the Cotton and Steel… I don't have any in my stash yet! Your camper projects are sweet. I would love Aneela Hoey's "Sew Stitchy" fabric. Congratulations on both of your anniversaries. Thank you for the giveaway. I would prefer the Sew Stitchy fabrics. Happy Anniversary on both blogging and marriage. Your projects are wonderful, I am inspired to get some sewing done. Beautiful projects! I love all the tiny details you put on those campers. Congrats on your blogiversary! I would prefer Cotton and Steel. Thank you for the giveaway! I would love the Aneela Hooey fat quarters! So cute! Thanks for sharing your good fortune with us! And congratulations again! The sew stitchy stack would be lovely. Woo hoo! Congratulations are in order! Keep up the great work. Sew Stitchy please, if I'm lucky enough to be a winner. Happy Blogaversary and Happy Anniversary! I hope you have a wonderful time celebrating both. And thanks for the great giveaway. I would be delighted with either of these fabric groups, and the Cotton and Steel is my favorite. Happy Anniversary!! If I won, I would love the Sew Stitchy but I really do like both. I love your campers! If I'm one of the lucky ones, I'd love to have the cotton & steel! Happy anniversary. Love both, but sew stitchy is my favorite. I really like the dots in Cotton & Steel. I am a dotty person! 🙂 But, I really like the pins in the other bundle as well. Congrats on your anniversary. I love both bundles so either would be fine! Congrats on your blogiversary! Love both prizes, but would choose C + S if I could — my horse-crazy niece would love to have something made from that mustang fabric! congrats! Your pick if I am the lucky winner! If I were to be drawn first, I'd pick the Mustang/basics fabric… for some reason I only bought it in pink and it's such an awesome fabric! I like the Aneela Hoey bundle! Cute little caravans! Thanks for the giveaway. Love the Sew Stitchy!! I think I'd go for Sew Stitchy! I like the second which is 6 fat quarters of Cotton + Steel basics and mustangs. I like them both. I really can't pick a favorite – would be happy to win either! Your work is just stunning, Anita!! I just adore those trailers! And the bunting! Brilliant! I think your MM challenge has a good chance. I love it and I bet your Mom does, too! It's perfect! Cotton and Steel! Thanks for a chance to win. I love the Sew Stitchy fabric. I'd prefer bundle two – the cotton and steel fabrics.